쌍벽당 김언구의 아버지 김균이 풍산의 구담으로부터 이곳으로 옮겨와 터전을 잡으면서 지은 것이라고 한다. 별당에 걸려있는 ‘쌍벽당 중수기’에 의하면 명종 21년(1566)에 안채를 지었다는 기록이 있다. 그 뒤 고종 1년(1864)에 남쪽 날개 3칸을 고쳤으며, 1892년에도 대대적인 수리를 하였다. 지금 '쌍벽당'이란 현판이 걸려있는 별당은 이때 건축된 것이다. 높지 않은 뒷산을 배경으로 산기슭에 자리잡고 있는 집으로 경사진 지형을 그대로 이용하고 있어서 행랑채가 낮은 자리에 있고 위에 안채의 몸채가 월등히 높게 지어져 있다. 다른 지방의 'ㅁ'자형 날개집에서 볼 수 있는 살림집에 속하는데 안채의 몸채가 유난히 과장되어 있는 점이 특색이다. 행랑채에 우뚝 솟은 솟을대문을 들어서면 안채에 달린 사랑방이 마주 보인다. 사랑방은 남쪽의 날개 3칸에 해당되는 부분이며, 쌍벽당이 지어지기 전까지는 이곳이 남자들의 거처였다. 중문채와 사랑채가 맞닿는 부분에 중문이 있는데 문을 들어서면 안마당에 넓은 대청이 있다. 이 넓은 대청을 '육간대청'이라 하는데 안채 몸채의 특징에 해당된다. 안채의 동쪽 사랑채보다 뒷쪽에 별당인 쌍벽당이 있고 그 뒷쪽에는 사각형으로 담을 쌓아서 사당을 세웠다. 조선 전기에 지은 집으로 추측되며 후에 2차에 걸쳐 수리를 하였으나, 평면과 구조의 중요부는 비교적 옛날의 제도를 잘 유지하고 있어 조선시대 주택연구에 좋은 자료가 된다. 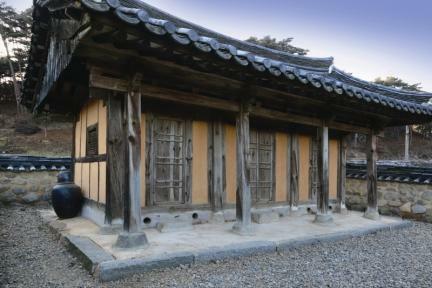 This house was built by Kim Gyun, father of Kim Eon-gu (pen-name: Ssangbyeokdang), after he moved from Gudam to Pungsan. 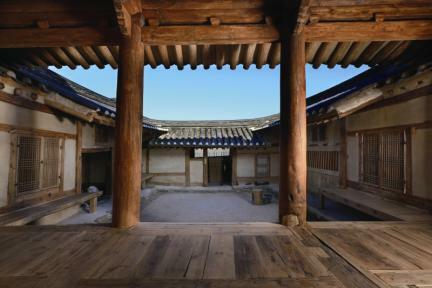 According to a record in “Ssangbyeokdang Jungsugi,” which was found in byeoldang (detached building), the anchae (women’s quarters) was built in the 21st year of King Myeongjong’s reign (1566). Later, in the 1st year of King Gojong’s reign (1864), three rooms in the southern wing were renovated, and the anchae was repaired extensively as well in 1892. 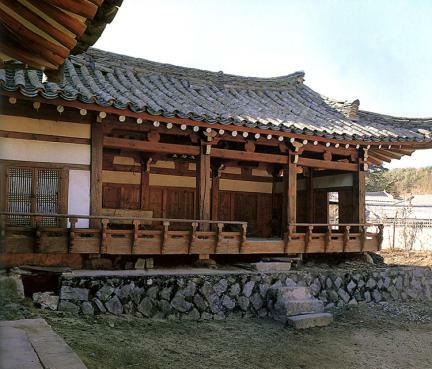 The byeoldang, a separate house with a hanging board inscribed with “Ssangbyeokdang,” was constructed at that time. 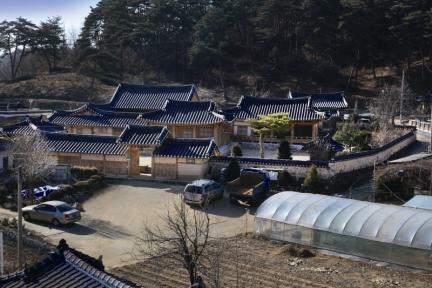 This house was built on a sloping area at the foot of a low hill, so the anchae looks much higher than the haengnangchae (servants' quarters). 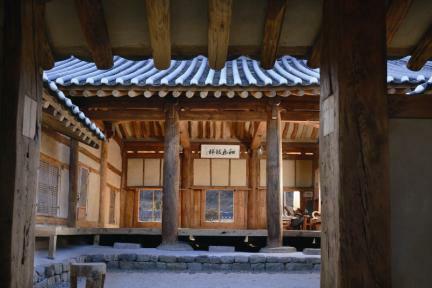 The structure of the house is similar to that of the “□”-shaped houses in other regions, but this house is characterized by the fact that the body of the anchae is prominently exaggerated. When one enters through the tall gate at the haengnangchae, one can see the sarangbang (master's room) attached to the anchae. 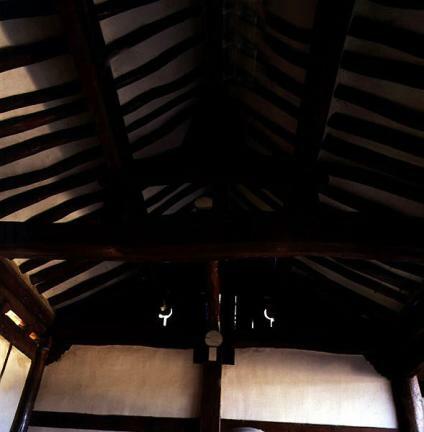 The sarangbang had been used as men's quarters until the construction of Ssangbyeokdang House was completed. There is a middle gate at the connecting point between the middle gate quarters and sarangchae (men’s quarters). 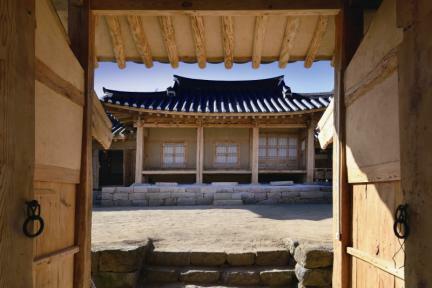 When one walks through the gate, one can see a spacious daecheong (main wooden floor), which works like the body of the anchae. Ssangbyeokdang House is at the far back compared to the sarangchae; further back is a shrine surrounded by a fence shaped like a square. 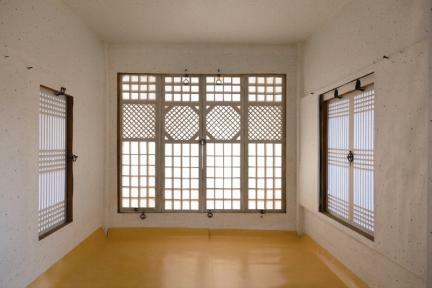 This house is presumed to have been built in the early Joseon Dynasty and was renovated twice after that. 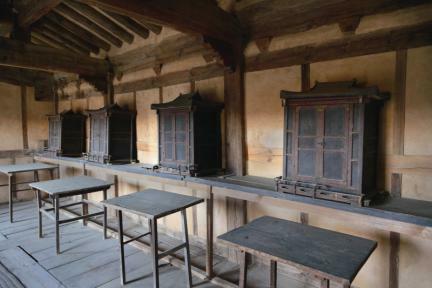 Note, however, that the major parts of its original structure and layout have been well-preserved; thus, this house is considered valuable in studying the houses during the Joseon Dynasty. ※ Viewing of the cultural property above is usually available anytime but may be limited depending on the owner’s personal circumstances.